Evan Kopchynski hauls in a TD catch for the Hilltops. A pre-kickoff wait only delayed the inevitable. Thanks to the stadium staff being a bit fast with pre-game cues, the venerable Saskatoon Hilltops and the visiting Winnipeg Rifles had to wait about 10 minutes before hitting the turf at Saskatoon Minor Football Field for their Canadian Junior Football League clash. The team introductions and the national anthem performed by country singer Lisa Moen were run with lightning fast speed. The Toppers mirrored that quick execution, when they hit the field. Bryant Sackney ran the opening kickoff back 100 yards to give the hosts a 7-0 lead. The speed and elusiveness displayed by Sackney on the run back was matched by the excitement Hilltops special teams coordinator Matt Yausie showed over the fact all his players on the wedge nailed their blocking assignments perfectly. The Hilltops proceeded to roll from there going up 21-0 shortly before the halfway point of the first quarter, 49-7 at halftime and cruised to a 65-9 romp in their regular season home opener. Just five minutes into the third quarter, Saskatoon started cycling in their backups. They entered the game eager to make plays as well like rookie running back Adam Machart, who scored a Barry Sanders like 46-yard touchdown run to account for the final major score put up by the home side. When the dust settled, the Hilltops put up exactly 400 yards of offence in a performance where they didn’t have either a 100-yard rusher or receiver. They only committed one turnover and gave up two quarterback sacks. Saskatoon’s defence held Winnipeg to 304 total yards, forced four turnovers and piled up eight sacks. Blake Hermann was a monster on a star-laden veteran defensive line hauling down Winnipeg signal callers on three different occasions. Bryant Sackney returns the opening kickoff for a Hilltops major. The Hilltops were firing on all cylinders. Their offensive line blocked solidly and offensive coordinator Sheldon Ball mixed up the play calling extremely well as the football was distributed all over the field to different playmakers. Running back Logan Fischer, who had two impressive high hurdle jumps in the outing, ran in a three yard major and hauled in a 15-yard pass for another score. Receiver Evan Kopchynski snagged a 35-yard TD grab on a streak play catching a beautifully thrown ball by quarterback Jared Andreychuk. Tailback Des Vessey also contributed a scoring plunge from a yard out. Saskatoon’s defensive line was successful in getting pressure with a four-man rush, which also included crushing Winnipeg’s running game. As a result, defensive coordinator Jeff Yausie could have the linebackers and secondary doing all sorts of different things, which caused the Rifles to cough up the ball. Linebacker Cole Benkic returned an interception six yards for a major score, while rush end Tom Schnitzler returned a fumble nine yards for another defensive score. Both of those scores were punctuated by excited celebrations. The Hilltops special teams have been clicking on a higher level than they did a season ago now under the guidance of Matt Yausie, who is the club’s rookie special teams coordinator. In building a 3-0 record, the Toppers have been good for one big special teams play a game this season, and they have racked up a whole bunch of hidden yardage in the return game. Head coach Tom Sargeant has been the manager that has challenged his talented coaches to elevate their performances, which has resulted in the team executing at a higher and higher level each week. Rush end Tom Schnitzler returns a fumble recovery for a Hilltops TD. Rifles starting quarterback Jamie Ybarra hit receiver Ian Lee for a nine-yard scoring strike in the first quarter, but the Winnipeg signal caller was knocked out of the game due to injury in the second quarter after that lone highlight. The visitors fell to 0-3. Now the Hilltops head off to their biggest challenge to date with two much anticipated clashes against their provincial rivals the Regina Thunder, who also improved to 3-0 by bombing the Huskies in Edmonton 76-9. While the Hilltops won the CJFL title last year, they dropped both of their encounters with the Thunder. With first place in the Prairie Football Conference on the line, the two clubs meet this coming Saturday at 7 p.m. at Saskatoon Minor Football Field and at 7 p.m. on Sept. 12 at Mosaic Stadium. Both of those matches have a high likelihood of becoming classic encounters. Sophie Shirley in action with the Saskatoon Stars. Sophie Shirley’s special summer might foreshadow an unforgettable winter. The 16-year-old Saskatoon product made Canada’s under-18 women’s hockey team which played in a three-game series against an under-18 squad from the United States from Aug. 20-23. Canada claimed two of those three contests, and Shirley had a goal in the red and white’s 5-2 victory that closed the three-game set on Aug. 23. Shirley was a third youngest player on the 23-member Canadian team. She has a strong chance of being on Canada’s roster for the under-18 worlds that will be held in St. Catharines, Ont., starting on Jan. 8 in the new year. It is common to have almost all the players from Canada’s under-18 team summer roster make the under-18 roster for worlds. As a 15-year-old sophomore last season with the Saskatoon Stars, Shirley had a spectacular campaign. She netted 22 goals and 17 assists helping the Stars post a 25-3 regular season record to allow Saskatoon to finish first in the Saskatchewan Female Midget AAA Hockey League. Shirley was named the most valuable player of the SFMAAAHL and proceeded to pick up 12 goals and 12 assists in nine games, as the Stars won their first league title. At the Esso Cup national championship tournament held in April in Red Deer, Shirley was named the event’s MVP, and she led the tourney in scoring potting nine goals and seven assists. You have to anticipate she will be making highlights for years to come. If you have any comments about this blog post, feel free to email them to stankssports@gmail.com. Check Twitter for more Hilltops game photos @Stankssports. A UFC title belt on display at the UFC Experience. When it came to making a first impression, the UFC brought its A-game to Saskatoon. Going into UFC Fight Night 74, I had never dealt with mixed martial arts top professional circuit in any form. To be honest, I don’t really follow the action in UFC at all. I knew basics like who Dana White, Tom Wright, Brock Lesnar, Georges St-Pierre and Ronda Rousey are, but that was about it. I covered mixed martial arts to a small level in the past, but I entered a new sporting world over the last three days that finished with the Fight Night 74 card on Sunday at the SaskTel Centre. As a first impression, I think the UFC has a really great thing going on. In early July, I received a call from Julie Scott, who is the senior editor for sports, arts and lifestyles, at The Canadian Press, and she asked if I wanted to cover the UFC’s first ever stop in Saskatoon and Saskatchewan for the national wire service. I jumped at the chance mainly because I had never done anything relating to the UFC before. Knowing it was followed by legions of fans and veteran sports reporters, I went into the experience with an open mind. I didn’t want anyone to taint what was my first experience with the circuit. I also ended up writing stories for the Saskatoon Express and this blog, so I was going to have a busy time. While there was an initial press function on Thursday, I jumped into covering the stop at the open workout held on Friday at O’Brians Event Centre. Very quickly, I was impressed by the professionalism of the UFC staffers, and that didn’t change at all during the Saskatoon stop. I ended up befriending the trio of Carolyn Blakely, Neil Springer and Stephanie Ura, and they were all so courteous and made life so much easier. Things ran so smoothly on the fight night itself. Usually when you cover a new sporting organization for the first time, there are usually some hiccups. On fight night, I really had to stretch my memory to recall any problems. In all honesty, that was the best first night out I ever had, when it came to covering a new sporting event. It was also cool to see how accessible Wright, who is the UFC’s executive vice-president and general manager for Canada, Australia and New Zealand, was. Wright, who is also a former commissioner of the CFL, wasn’t just accessible to the press, but he spent lots of time meeting fans, who were visibly pumped to talk to the organization’s top Canadian boss. Max Holloway chats with reporters. The fighters themselves were really engaging. They all have cool individual background stories, and you could quickly see why the beat reporters want to stay hooked into the circuit. You could also tell the fighters also have a genuine mutual respect for each other. One example of that respect came at the weigh-ins. After the fighters for each match were weighed in and did the press fight photo pose, they pretty much all gave each other the brother hug. In the case of Montreal lightweight fighter Olivier Aubin-Mercier, he presented sugary treats to his opponent in Tony Sims of Denver, Colorado. Stereotypically, one expects the weigh-ins to break down into a series of trash talk taunts, where the fighters appear set to throw chairs at each other. That was far from the case at the UFC weigh-ins. The respect aspect was reinforced during the post-fight press conference. Hawaiian Max Holloway (14-3) had a bittersweet main event win over fellow featherweight Charles Oliveira (20-5) of Sao Paulo, Brazil. Oliveira came away favouring his right shoulder after an exchange forcing him to retire at 1:39 of the first round. Holloway, who was the UFC’s fifth ranked featherweight, was given a knockout victory, while Oliveira, who was the UFC’s seventh ranked featherweight, fell to the ground holding his shoulder and was carried away on a stretcher. In a post-match interview live from the ring, Holloway asked the fans to pray for Oliveira. Holloway made certain to show his concern for his opponent at the press conference, when asked about how the win came. “It sucked,” said Holloway. “I train super hard, but it comes with the territory. My prayers go out to Charles (Oliveira). “At the end of the day, these guys have to understand that he is ranked number seven in the world, so he probably only does this, and he gets money probably only fighting. Injuries set you back. Out of the 12 bouts on the UFC card, the first 10 were really good, with the last of that stretch being the welterweight fight between Patrick Cote and Josh Burkman, which was given fight of the night honours. The back and forth physical battle ended at 1:26 of the third round, when Cote, who is from Rimouski, Quebec, knocked out Burkman, who is from Salt Lake City, Utah. The crowd of 7,202 at the SaskTel Centre rose to their feet to give their loudest ovation of the night. Two girls take part in a jousting game at the UFC Experience. Overall, the first 10 fights overshadow boring co-main event split decision welterweight victory of Denver, Colorado’s Neil Magny over Brazilian Erick Silva and the bad luck of Oliveira’s injury in the main event. Besides the fights, fans also enjoyed the UFC Experience, which was set up in the SaskTel Centre parking lot on Saturday and Sunday. The UFC Experience contained sport specific fun physical tests and games. One of the most popular features was the chance to have you picture taken with the title belt. On Friday, the UFC also donated $10,000 to local Special Olympics programs though UFC Community Works. In making a good first impression, the UFC’s first stop in Saskatchewan was a success. Hopefully, the organization’s next fight card won’t be too many years away. If you are interested in checking out the story I did for The Canadian Press on UFC Fight Night 74, it can be found on the Winnipeg Free Press website here. When I saw my story on the Free Press site, I was hoping they might allow me to cover the NHL’s Winnipeg Jets as a beat writer. It was just a thought. (Lol). The venerable Saskatoon Hilltops made short work of the Rifles in Winnipeg on Sunday. The defending Canadian Junior Football League champions blasted the host Rifles 50-9 at Investors Group Field to improve to 2-0. The Rifles fell to 0-2. Hilltops running back Logan Fischer gained 172 yards on the ground, which included an 80-yard TD run. Fischer had two scores on the ground in the romp. Saskatoon’s biggest play came from Liam Murphy, who returned a missed field goal 125 yards for a major in the third quarter. The defence got in on the scoring act thanks to a long interception return touchdown coming from defensive back Luke Melnyk. The Hilltops and Rifles go at it again, when Saskatoon hosts its regular season home opener this coming Sunday at 1 p.m. at Saskatoon Minor Football Field. Neil Magny, right, gets set for a sparring session. Neil Magny is the epitome of the man who will fight anywhere at any time in any place. How else can you explain the fact that the Brooklyn, N.Y., product will step into a UFC octagon for the second time in less than a month. On Aug. 5, Magny fought at UFC 190 in Rio de Janeiro, Brazil, where he lost by a second round submission to Demian Maia of Sao Paulo, Brazil. The loss ended a seven-fight winning streak and dropped the welterweight to 15-5. Just over three weeks later on Sunday, Magny will step into the cage at the SaskTel Centre for UFC’s Fight Night 74 to face another Brazilian product in Erick Silva (18-5) in the card’s co-main event. Magny is filling in as a replacement fight for Rick Story, who had to pull out of the originally scheduled bout due to an injury suffered near the end of his training camp. With just less than two weeks’ notice, Magny accepted the fight offer, and he said his decision didn’t revolved a whole lot on his loss on Aug. 1. “I would say that played a part of it, but honestly, I don’t think it does,” said Magny, who is ranked 15th in the UFC’s welterweight rankings. “It was just mainly the opportunity that I got. “My last year it showed. Every time my phone rang, it was Joe Silva. ‘Yeah, sure, I will do it. Put me in coach.’ I was just eager to get in the cage and take advantage of it. Magny accepted a lot of phone calls from Joe Silva, who is the UFC’s vice-president for talent relations and matchmaker, last year and appeared in five fights winning them all. As a result of that accomplishment, Magny shares the UFC record for fights won in a calendar year at five with Roger Huerta. Even with that in mind, the fact Magny accepted the fight on short notice impressed his opponent on Sunday. Erick Silva speaks to reporters on Friday in Saskatoon. “First of all, I need to congratulate him for accepting this,” said Erick Silva through an interpreter. “Not any fighter would take another fight in a month after he fought. “He had a negative result, but I don’t think he is going to come in and try to be desperate or try to do anything crazy. I think he is going to be well trained, and he is going to be the Neil Magny that we know. Magny said the quick turnaround of entering another match isn’t a worry because his game plan doesn’t change much from fight to fight. He said Silva provides a tough challenge. “He is an explosive guy,” said Magny. “He comes out in the first round pretty hard. “I have fought explosive guys. I fought guys that do jiu-jitsu. I fought guys that are really accomplished strikers. Silva said it is a bit difficult, when an opponent changes two weeks before a fight. He said the key thing he has to do is avoid over training. The biggest adjustment Silva faces is the fact he is now going against an opponent who stands 6-foot-3 in height in Magny as opposed to Story, who is 5-foot-10. “We have a lot of tall guys, a lot of guys with a long reach in the gym,” said Silva. “I am used to training with those guys. The main event of Fight Night 74 features a featherweight clash between Charles Oliveira (20-4) of Sao Paulo, Brazil, and Max Holloway (13-3) of Oahu, Hawaii. Holloway sits fifth in the UFC’s featherweight rankings, while Oliveira is rated seventh. The winner will be a big step closer towards gaining a title shot. “It is a make you or a break you fight,” said Holloway. “You lose in the UFC it is a hard loss. You are starting from the bottom again. Oliveira believes he can go toe-to-toe with Holloway, if the fight leans that way. “I have always said you have to respect his stand-up,” said Oliveira through an interpreter. “I’ve worked a lot on it too. Patrick Cote (22-9) of Montreal faces Josh Burkman (28-11) of Draper, Utah, in a welterweight fight on Sunday. During a session of open workouts held on Friday at Saskatoon’s O’Brians Event Centre, Cote received the largest cheers from the 100 or so spectators that were in attendance, and he made sure to spend time with the crowd. “The fans are awesome,” said Cote. “I feel I have their support every time I fight in Canada. Fight Night 74 is loaded with matches containing Canadians. The preliminary fights feature Shane Campbell (11-3) of Kelowna, B.C., taking on Brazilian Elias Silverio (11-1) in a lightweight tilt; Chris Kelades (8-2) of Cole Harbour, N.S., clashes with Nikita Krylov (18-4) of Donetsk, Ukraine, in a heavyweight bout; Yves Jabouin (20-10) of Montreal battles Felipe Arantes (16-7-1) of Newark, N.J., in a bantamweight match; and Sam Stout (21-11-1) of London, Ont., faces Frankie Perez (9-2) of Howell, N.J., in a lightweight tilt. The main card sees Montreal products Chad Laprise (11-0) taking on Brazil product Francisco Trinaldo (17-4), and Olivier Aubin-Mercier (7-1) takes on Tony Sims (12-2) of Denver, Colorado, in separate lightweight matches. Also on the main card, Montreal’s Valerie Letourneau (7-3) battles Maryna Moroz (6-0) from Volnogorsk, Ukraine, in a women’s straw weight tilt. Troy Scheer, who is the owner and trainer of Saskatoon’s Scheer’s Martial Arts, believes the UFC brought a quality card to Saskatoon for the UFC’s first stop in Saskatchewan. I caught up with Scheer for the Saskatoon Express, and that story can be found here. If you have any comments you would like to make about this blog post, feel free to email them to stankssports@gmail.com. A 1998 Cougars wrestling card featuring Brock Lesnar. That question echoed in whispers throughout the crowd at the University of Regina’s Physical Activity Centre on a cold winter night in January of 1998. University of Regina Cougars wrestler Adrian Gilmore left his team’s bench for his heavyweight match in a dual meet against the Bismarck State College Mystics and immediately stared into the eyes of an imposing opponent. Off the Mystics bench came this monster looking of a man, who was built like a tank. Gilmore stood 6-foot-1 and weighed 243 pounds and his opponent was 6-foot-3 and weighed about 270 pounds, but the sheer mass of the visiting wrestler made Gilmore, who was an all-Canadian the previous season, look small. A gasp came from the crowd as the hulking huge Mystic wrestler glared back at Gilmore with a stone-cold look. The Bismarck State College wrestler’s name was Brock Lesnar. That’s right – Brock Lesnar. The same Brock Lesnar who would go on to fame as a UFC heavyweight champion and a WWE star attraction. Back in that January day of 1998, no one would have fathomed Lesnar would become famous. At the time, the Cougars men’s wrestling team were the defending Canadian Interuniversity Sport champions locked on a mission to repeat. A few of the team’s members had been part of Canada’s national team system. The meet with the Mystics was scheduled to spark the Cougars into the second half of their season. As defending national champs, the Cougars also drew big crowds to their small home gym, who would overflow the two sets of stands that were usually set up for match nights. Gilmore had aspirations at the time to represent Canada at the Olympics and was also a standout defensive lineman for the Regina Rams, who were still in the Canadian Junior Football League at the time. He had helped the Rams win their 14th CJFL title in November of 1997. The Moose Jaw, Sask., product was a finely conditioned athlete, and you could see in the eyes of the spectators they wondered what magic Gilmore could pull off to beat this beast that stood in front of him. 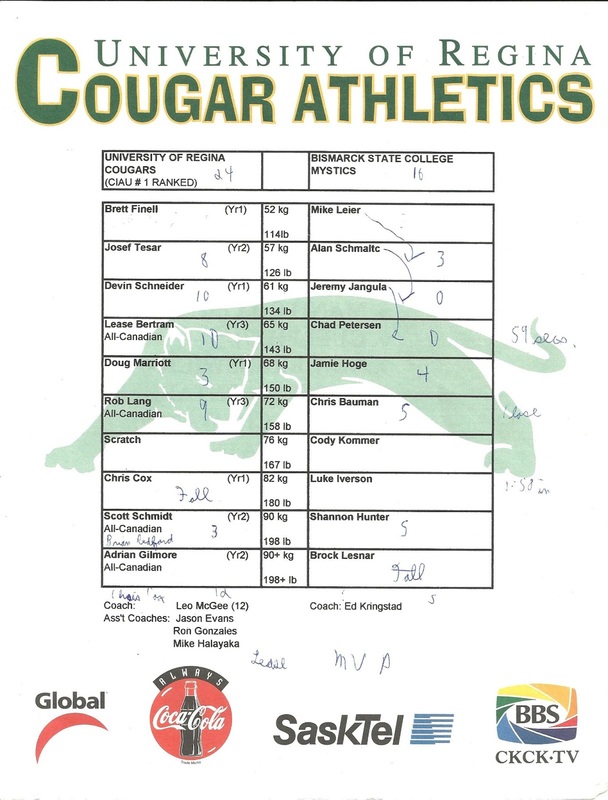 Going into the heavyweight bout, the Cougars claimed the vast majority of the matches in the other weight classes and had already won the meet. Gilmore was looking to add a cap to what was already an impressive night for the host squad. Lesnar had other ideas. Very quickly, it was obvious to see that Lesnar was overpowering Gilmore with sheer strength. The U of R standout tried to attempt a leverage move and ended up getting stuck up in the air. Lesnar caught Gilmore and proceeded to power bomb him into the mat. The violent look of the image was shocking. Gilmore ended up being cut open on his forehead, and the officials called a timeout. When the match resumed, Lesnar’s power was too much to overcome and the visitor claimed victory by a pin. For those that saw that match, Lesnar’s victory was hard to forget. With the Mystics located in Bismarck, North Dakota, their visit to the U of Regina would ultimately become a footnote in the Cougars 1997-98 campaign. 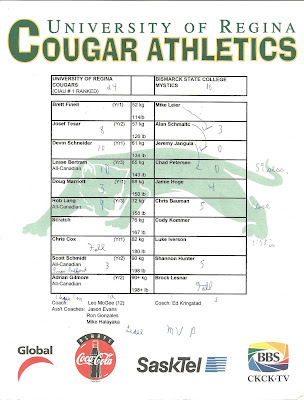 The Cougars continued to romp over the opposition at dual meets and tournaments and would repeat as CIS champs. Lesnar went on to finish the 1997-98 campaign as the national junior college heavyweight champion in the United States. He transferred over to the University of Minnesota to compete at the National Collegiate Athletic Association’s top level and won the NCAA’s national heavyweight title in 2000 to close a four-year post-secondary career with a 106-5 overall record. From there, Lesnar embarked on his storied forays into the WWE and UFC. In a twist that is unrelated with his 1998 match against Gilmore, Lesnar and his family have spent a large amount of time residing in Regina in recent years. Almost no mementos exist from Lesnar’s amateur wrestling match in Regina, and the Queen City’s CTV and Global affiliates likely no longer have footage stored away from that night. For those that were there to witness what happened, they were treated to one of Lesnar’s early star moments, even if they didn’t know it at the time. Lease Bertram was U of Regina's most outstanding male athlete in 1998. Had the UFC rocketed to a lucrative mainstream sport about a decade sooner than it did, one member of the University of Regina Cougars men’s wrestling team could have been one of the circuit’s biggest star attractions. 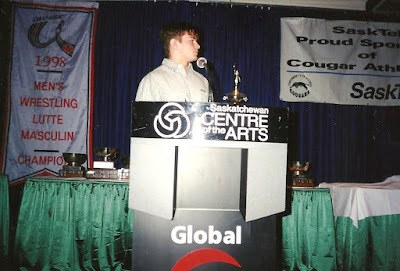 The Cougars 1997 and 1998 CIS championship teams were filled with stars, and Lease Bertram was the star that shone the brightest during both those campaigns with all due respect to heavyweight and 2000 Olympian Dean Schmeichel. Bertram won an individual CIS national championship silver medal in 1997 in the 65-kilogram class and an individual CIS national championship gold medal in 1998 in the 68-kilogram class. Bertram was a member of Canada’s national team program at one point in time and was also the U of R’s most outstanding male athlete in 1998. The Eston, Sask., product was one of the best athletes ever in the history of the athletics program at the U of R.
Pound for pound, Bertram was likely the toughest athlete the U of R ever saw, but he wore that toughness in a quiet manner. When he hit the wrestling mat, Bertram was all business. Besides being extremely well conditioned, Bertram was gifted in the sport technically, and that gift was taken to a higher level under the guidance of Cougars head coach Leo McGee. When Bertram competed in a match, you knew you were watching something special due to the way he made it look easy, when he put three to four moves together. He almost always won matches by technical superiority gaining a 10-point lead often in under two minutes and frequently in under a minute. Away from mat, Bertram became part of Cougars folklore, when he helped catch a couple of punks that tried to rob the U of Regina’s Campus Recreation office in late February of 1998. At the height of his success, Bertram walked away from wrestling at the end of the 1997-98 campaign at age 22, when he still had two years of CIS eligibility remaining. Amateur wrestling isn’t one of the most popular or followed sports in Canada, and Bertram’s motivation to continue wasn’t there. When Bertram was a Cougars’ superstar, mixed martial arts was still viewed as an underground, freak-type sport, and the UFC was a fledgling body. That all changed when Dana White became president and a minority owner in the promotion in 2001. White was instrumental in vaulting the UFC into the mainstream and turning mixed martial arts' top professional loop into a billion-dollar business, where fighters could make millions in income. Traditionally, fighters with strong amateur wrestling backgrounds have excelled in the UFC. Playing the “what if” card especially with the UFC making its Saskatchewan debut on Sunday with its Fight Night 74 card set for 4 p.m. at the SaskTel Centre in Saskatoon, Bertram might have remained in wrestling, if the UFC would have been the powerhouse entity it is now back in 1998. He could have taken his skills into a very viable professional outlet. With his work ethic and gifted ability, I could see Bertram posting submission victory after submission victory and being a dominate force and title holder in the lightweight division. Thanks to the UFC’s platform, the masses around the world would have gotten to see just how special of an athletic talent Bertram was. Unfortunately, the timing in real life wasn’t there, but for those that saw Bertram compete, it is always cool to dream of what might have been. James Vause and the Hilltops defence came up big against the Calgary Colts. A special teams spark paved the way for an opening day victory for the Saskatoon Hilltops. On Sunday in Calgary, the visiting Hilltops were locked in a toe-to-toe battle with the host Colts in the opening regular season game for both Canadian Junior Football League teams. The clubs were tied 10-10 at halftime, and the Hilltops pushed in front 13-10, when Brett Thorarinsson kicked a field goal on his team’s first possession of the second half. The visitors took control of the contest on Calgary’s ensuing series. The Colts were forced to punt, and the Toppers loaded up for a full out rush. Sophomore linebacker Bobby Ehman blew through the Colts line to block the kick and fourth year defensive lineman Dillon Buckle recovered the ball in the Calgary end zone for a Hilltops touchdown that made the score 20-10. The Hilltops momentum continued to snowball. Shortly after that score, the Hilltops got the ball back again and quarterback Jared Andreychuk hit tailback Logan Fischer with an outlet pass for another major to put Saskatoon in front 27-10. From there, the visitors cruised to a 31-10 victory. While the final outcome was convincing, the Hilltops had to fight for the opening win. They led 3-0 after the first quarter and vaulted ahead 10-0, when Andreychuk hit fifth-year receiver Evan Kopchynski with a 65-yard TD pass. The Colts stormed back to tie the score before halftime at 10-10. The final outcome was sealed thanks to Ehman’s block and the fact the Hilltops read and react defensive scheme forced a number of turnovers. Saskatoon’s defensive line was able to get pressure on Colts quarterback John Kiesman with just a four-man rush. Thanks to that pressure, the Hilltops secondary could jump upon a number of hurried throws. Thorarinsson kicked a total of three field goals in the win, and Hilltops defence grounded the Colts offence down to a halt. Saskatoon’s offence didn’t have its biggest game but made big plays at key times. The Hilltops (1-0) return to action this coming Sunday, when they travel to Winnipeg to take on the Rifles (0-1). The Rifles dropped their opener 49-32 on the road against the Thunder in Regina. Lisa Thomaidis is a stellar coach. Canada’s senior national women’s basketball team arguably had its most memorable summer ever. On Sunday in Edmonton, Canada claimed gold at the FIBA Americas women’s basketball championship downing Cuba 82-66 at the Saville Community Sports Centre. Kia Nurse, who has stepped into the national spotlight as a 19-year-old prodigy, led the way for the red and white with 20 points, while Natalie Achonwa chipped in 12 points. Leidys Oquendo topped Cuba with 25 points. Canada trailed at one point in the opening quarter 18-10, but rallied to go ahead 44-35 at halftime. Cuba started the second half on an 11-0 run to go ahead 46-44, but Canada rebounded to hold a 65-54 edge at the close of the third quarter. The win over Cuba allowed Canada to lock up a berth at the 2016 Olympics in Rio de Janeiro, Brazil. Canada national women’s basketball team turned a lot of heads in July claiming gold at the Pan Am Games in Toronto downing the United States 81-73. Nurse scored 33 points in that victory. While Nurse has become a star, the team play of Canada’s senior national women’s basketball team might have never been more polished. They moved the ball around extremely well and were tough on defence. 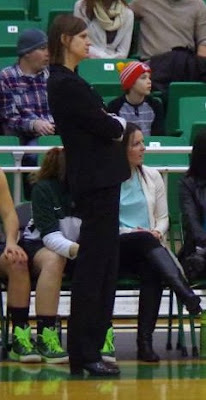 Canada is guided by head coach Lisa Thomaidis, who has been the head coach of the University of Saskatchewan Huskies women’s basketball team since 1998. Under Thomaidis, the Huskies have always played with sound structure, and it is obvious she has worked the same magic with the national program. Canada’s team is loaded with great players, but Thomaidis has to be given huge credit for bringing everything together. Davis Mitchell hauls in a pass for the Hilltops. Success won’t be a given for the Saskatoon Hilltops entering the 2015 campaign. Since the modern version of the franchise was born in 1947, the Hilltops have traditionally been one of the dominant programs in the Canadian Junior Football League winning 17 national championships. They are the defending Canadian Bowl champions and have captured the CJFL’s crown in four of the last five years. On the road to repeating as CJFL champs, the Hilltops hardest challenge might be getting out of the Prairie Football Conference. Saskatoon has been one of the dominant teams in the PFC since the loop was formed in 1976. While that dominance hasn’t changed over the last 15 years, the quality of the circuit’s other teams has improved, and during that span of time, the conference’s other squads have taken turns being a real threat towards the Hilltops’ run of success. The Edmonton Huskies displaced the Hilltops at the top of the CJFL mountain winning back-to-back Canadian Bowls in 2004 and 2005. The Edmonton Wildcats took the PFC title in 2006 and 2009 advancing to the Canadian Bowl in both of those campaigns only to fall to the Vancouver Island Raiders. This year, the Hilltops two biggest conference threats are likely the Regina Thunder and the Calgary Colts. The Thunder captured the CJFL championship in 2013 and won both their head-to-head matches with the Hilltops last season. The Colts are entering their second season under the guidance of head coach Matthew (Snoop) Blokker. Blokker joined the Colts after obtaining legendary status as the head coach of the Vancouver Island Raiders of the British Columbia Football League. He guided the Raiders to three Canadian Bowl championships, and he was the BCFC’s winningest coach posting an 89-13-2 mark at the helm of both the Raiders and Victoria Rebels during his career. Under Blokker, the Colts went from being an 0-8 club in 2013 to a team with a 4-4 regular season record in 2014. Calgary advanced to the PFC final before being thumped 27-7 by the Hilltops in Saskatoon at Saskatoon Minor Football Field. The Hilltops travel to Calgary to take on the Colts at McMahon Stadium on Sunday at 1 p.m. Saskatchewan time in a match that opens the 2015 regular season for both clubs. With Saskatoon returning most of its roster from last year’s CJFL title winning team, you can bet the Colts are viewing the 2015 regular season opener as a Super Bowl type game. If the Colts can pull out an upset victory, it would be a statement win showing the rest of the CJFL they are a contender. Calgary enters Sunday’s contest fresh off a 33-14 exhibition win over the Regina Thunder in a neutral site game at Medicine Hat on Aug. 8. The Colts added John Kiesman at quarterback looking to make an upgrade at that position. Kiesman suited up previously for the CIS's University of Regina Rams and the CJFL's Winnipeg Rifles. Brett Hunchak and Cole Meyer quarterbacked the Colts in 2014. Receiver Jevon Cottoy made the PFC’s all-rookie team last season topping the Colts with 26 catches for 524 yards and four touchdown receptions. Calgary also returns the CJFL’s defensive player of the year in Jakub Jakoubek. In 2014, the big play linebacker had 48 tackles, 16 assisted tackles, four knockdowns, two forced fumbles, two fumble recoveries and two interceptions. The Colts were also strong at forcing turnovers posting a plus-14 in the takeaway/giveaway category. The Hilltops head into 2015 with a roster that contains 15 players in their 22-year-old years, and the Toppers have the potential to be better than they were a year ago. Saskatoon posted a 9-2 overall record last season including action in the regular season and playoffs. Quarterback Jared Andreychuk completed 99-of-201 passes for 1,624 yards, 11 touchdowns and five interceptions. During the 2014 post-season, Andreychuk and the offence performed at an extremely high level, where the signal caller posted back-to-back 300-plus yard passing games in the PFC final and the Canadian Bowl. Now in his fourth season, Andreychuk could put up numbers that make his 2014 totals look pedestrian. He also big time benefits from the fact he gets to air the ball out to a group of talented receivers that includes Evan Turkington, Evan Kopchynski and Davis Mitchell. Turkington attended training camp with the CFL’s Saskatchewan Roughriders. Star tailback Wayndel Lewis, who was the CJFL’s offensive player of the year in 2014, graduated from the Hilltops program and will suit up for the University of Saskatchewan Huskies in the upcoming CIS season. Third year veteran Logan Fischer will give the Hilltops a strong presence at tailback. When Lewis missed last year’s PFC final and Canadian Bowl due to injury, Fischer ran for a combined 274 yards in those two contests on 47 carries. The offensive line is solid with Terry Thesen at right tackle, Nathan Heide at right guard, Jordan Hydomako at centre, Drayke Unger at left guard and Tyler Hoath at left tackle all expect to start. Thesen, Heide and Hydomako are all in their fifth years, while Unger and Hoath are on their fourth years. The Hilltops defence forces a turnover during the squad's alumni game. Defensively, the Hilltops were strong at forcing takeaways posting a plus-17 in the takeaway versus giveaway category. Defensive back Dylan Larson was the defensive player of the game in last year’s Canadian Bowl, and he will be part of a strong secondary including fifth-year safety and captain Austin Thorarinson. Fifth-year veteran Quinn Pierce should help anchor a strong group of linebackers. Fifth year veterans Blake Adams and Matt Kozun are keystones on the defensive line, while third-year vet Blake Hermann will be a force off the edge. Kozun was also in camp with the Roughriders. For Week 1 of the PFC season, the clash between the Hilltops and Colts will make for an interesting early measuring stick. NOTE – Second year defensive halfback James Vause, who will be in his first year as a starter, traded in his old #4 jersey for #24 this season. Vause wanted to wear #24, because that was the number worn by Cody Smuk, who was the gritty and hard-working former forward with the U of Saskatchewan Men’s Hockey team. Smuk passed away of cancer in June, and he was engaged to Vause’s older sister, Stephanie. It seems all Canada does at the Ivan Hlinka Memorial Cup is win gold. On Saturday, Canada captured gold for the eighth straight year at the annual summer under-18 tournament held in the Czech Republic. In the championship final, Canada dumped Sweden 7-3 at the Alcaplast Arena in Breclav in the Czech Republic. Pierre-Luc Dubois, who play for Cape Breton of the Quebec Major Junior Hockey League, led the way for Canada with a pair of goals and an assist. The red and white received singles from Michael McLeod, Tyler Benson, Tanner Kaspick, Jordan Kyrou and Beck Malenstyn. Netminder Dylan Wells made 15 stops to pick up the win in goal for Canada. Jesper Bratt, William Fallstrom and Alexander Nylander replied with singles for Sweden. Filip Gustavsson stopped 10-of-14 shots starting in goal for Sweden before being pulled after Canada went ahead 4-0 at the 16:54 of the first. Isak Wallin turned away 18-of-21 shots playing the rest of the way in relief. Canada was a perfect 7-0 at the Ivan Hlinka tourney guided by head coach Stan Butler and assistant coaches Shaun Clouston and Darren Rumble. The bench bosses guided an impressive collection of young talent, who should be fun to watch for years to come. Sophie Shirley in action for the Saskatoon Stars. Saskatoon product Sophie Shirley was hoping to leave a positive impression with the Hockey Canada brass. The 16-year-old forward was in Calgary taking part in the selection camp for Canada’s under-18 women’s team, which wrapped up on Saturday. Shirley is the fifth youngest player among the 42 invites looking to crack a spot on the 23-player squad that will travel to Lake Placid, N.Y., for a three-game series against the United States’s under-18 squad from Aug. 20-23. Shirley had a goal and two assists in four camp exhibition games playing for Team White. She is listed as now standing 5-foot-8 in height, which means she has grown four inches over the summer since last playing for the Saskatoon Stars girls’ midget AAA team. As a 15-year-old sophomore last season with the Stars, Shirley had a spectacular campaign. She netted 22 goals and 17 assists helping the Stars post a 25-3 regular season record to allow Saskatoon to finish first in the Saskatchewan Female Midget AAA Hockey League. As Shirley is one of a handful of 16-year-olds at Canada’s under-18 camp, she is gaining valuable experience being on Hockey Canada’s radar. If she doesn’t make the under-18 team this year, she will more than likely be a big prospect for the team next year. During events like Olympic gold medal hockey games, the Canadian flag is a proud symbol that unifies a nation. If you look closely into the white space between the red bars, it is also said you can visualize two faces getting ready to have an argument or a fight. While there has been a lot of recent concern about apathy regarding politics in Canada, those that are involved or interested in how the country’s government work are passionate about their views. Unfortunately these days, it seems like that passion is almost taken to the extremes. It feels like if you have friends on the left wing of the political spectrum that it is frowned upon to friends on the right wing and vice versa. Things really become polarizing when you mention the name of Prime Minister Stephen Harper and his Conservative party, which have formed the government since first being elected in 2006. Now, I admit I am far from a political animal. I feel way more comfortable analyzing the happenings in the sports world specifically when it comes to hockey and football. I am a bit out of my element in the political world, but I feel I am educated enough to offer an opinion. In talking to friends and acquaintances who have vested interests or follow politics, it feels Canada in the present is sharply divided into two factions. There are those that like Harper and the Conservatives and those that don’t. Those that support Harper and the Conservatives and those that don’t are deeply hardened in their positions. I also get the feeling those friends and acquaintances are so hardened in their positions that there is no room for friends on the other side. It seems that those that support Harper and the Conservatives view anybody that is on the other side as the enemy, and similarly, those that don’t support Harper and the Conservatives also view anybody on the other side as the enemy. Early in this 78-day campaign, it seems emotions haven’t run too high, but I fear that could and will likely change near the end of the campaign. Growing up, I remember often hearing the cliché that the two worst things to talk about in a big gathering of people were politics and religion, because those subjects cause emotions to run high. That cliché was further reinforced in my late teens, when I saw my late father, who mainly supported Conservative and right wing parties in his life, get extremely upset at a big family gathering at certain individuals that wouldn’t follow his line of thinking. In the current day, it seems like there is a sizable minority in Canada that are so vested in their respective political sides that I could envisions emotions boiling to the point at the end of the election that situations will occur where friends and family members will choose not to talk to each other for a lengthy period. By tradition, the democratic society in Canada encourages debate, but in practice, it doesn’t feel debate is followed. When it comes to politics, it is more of a case that two people on opposite sides get in an argument, take things at a personal level and depart in disgust. There doesn’t seem to be a mutual respect. Since I turned the eligible age to vote, a total of six federal elections have been held in Canada. Over the course of those elections, I have been one of those swing voters who has casted ballots for the Conservatives, Liberals and the New Democratic Party. I mainly voted on who I felt by conscience would form the best government. To the dismay of my left wing friends, that included voting for Harper and the Conservatives at one time. To the dismay of my right wing friends, I won’t be voting for Harper and the Conservatives this time around. With that said, I do not want to say who you all should vote for. When you step into that ballot box way down the road on Oct. 19, you have to do what your conscious dictates. Unfortunately when Oct. 20 rolls around, I can see Canada that is more divided than ever on the right versus left divide. I hope I am wrong. I would like to believe that every political party honestly believes they are doing what they think is best for the country. In the modern era, that belief is something that is tough to hold on to, as the perception exists that politicians are in that game for their own self-interests and to funnel money to their friends. That likely adds to the voter apathy that is present in most elections. It would be great if some great unimaginable event could occur to restore faith in the electoral system, but I think that likely won’t occur any time soon. Corey Chamblin has had a rocky season as Roughriders head coach. For now, the Corey Chamblin deathwatch is on hold in Rider Nation. The voices calling for the head of the head coach of the Saskatchewan Roughriders will only stay somewhat muted until the next sign of trouble. If the Roughriders totally lay an egg in their clash against the Argonauts in Toronto on Saturday, the deathwatch will be on again. You will also likely see the odd story appear in a mainstream media outlet saying Chamblin will be axed and another person is about to be brought in as head coach. That could possibly result in Roughriders general manager Brendan Taman holding another media conference to say Chamblin is safe like the one that was held earlier this week. Welcome to the daily life of players, coaches and management of the Roughriders, who constantly live in a fishbowl and forces outside the organization can turn things into a soap opera. When the team starts 0-6 for the time since 1979, the fishbowl becomes that much smaller. The 1979 club lots its first 12 in a row and finished with a 2-14 mark. Whenever the voices rally again calling for Chamblin to be dumped, it has to be noted that type of change likely won’t help the Roughriders, but it has a high probability of making things worse. In the modern era of professional football or even football at the university level be it Canada or the United States, a mid-season coaching change has less of a chance to provide a temporary spark or shake up compared to any other sport. When you dump a head coach, you basically dump the system that head coach brought in. The team will likely have a week, or even two weeks to try and learn a new system for the next game. In all reality, the mid-season replacement head coach would be smart to keep using the system his predecessor had in. The preparation a team puts in during a week has a huge classroom component, which most in the general public likely don’t have an appreciation for. For every hour a player spends on the practice field, it is likely he spends at least three hours studying video. The coaches go through more video than the players. At the professional and university levels, it is also common for the head coach to sleep four hours a night in his office at various times in the preparation week. During a meeting, it is possible to go through just one play for 15 minutes. The days when quarterbacks called their own game and squads only ran like 30 different offensive plays are long gone. Playbooks these days are thick. Due to all the preparation that needs to be done during a football work week, teams are basically saddled up with the current coaching staff for the duration of the season. If a coaching change is made, it is easier to do it in the off-season. Hench in the NFL, that is why every Monday after the regular season ends you usually see a large amount of coach firings. No other sport undergoes this type of preparation work. It is common to come across hockey coaches that say they don’t put in the hours their counterparts do in football. In the current CFL season, the biggest turning point for the Roughriders came in Week 3, when they led the B.C. Lions in Vancouver 29-18 with 2:21 to play and fell 35-32 in overtime. Holding a 29-26 edge, the Roughriders faced a third and one at their own 48. If the Roughriders gambled to get a first down, they would be able to end the game with kneel downs. The Argonauts and Roughriders face each other on Saturday in Toronto. The visitors elected for the gamble and quarterback Brett Smith was stuffed on a sneak play. The Lions kicked a field goal to force overtime, and the rest is history. Immediately after that game on social media, Roughriders fans expressed their displeasure and took shots first at new defensive coordinator Greg Quick. The anger quickly moved to Chamblin, who in the off-season replaced Roughriders great Ritchie Hall as defensive coordinator with Quick. From that time, Chamblin’s work has been dissected in almost every way imaginable good and bad, especially when it comes to his influence on the defence. It seems no one remembers that Chamblin was the Roughriders head coach when they posted an 11-7 regular season record in 2013 and moved on to win the Grey Cup on home turf in a 45-23 romp over the Hamilton Tiger-Cats. Chamblin has earned the right to have a bad season and should be given the chance to turn things around. It also must be noted that might not be possible in Saskatchewan. When the Roughriders won the Grey Cup in 1989, then head coach John Gregory could have run for premier of the province after his team’s 43-40 victory over the Hamilton Tiger-Cats in Toronto. Gregory was still very much loved two years later, when he was dumped as Roughriders head coach after the green and white started the 1991 season at 1-6. Saskatchewan finished with a 6-12 regular season mark to miss the playoffs. Chamblin was never as popular as Gregory was even during good times. On top of that, the Riders are starting Smith, who is in his full rookie season, at quarterback due to injuries to standouts Darian Durant and Kevin Glenn. Saskatchewan is also mired in a host of other injuries as well. At the moment, a new head coach would likely have a harder time cracking the win column than Chamblin does now. David Stevens scores the winning touchdown for the "Has Beens." Looking upon the post-game scene at Saskatchewan Minor Football Field on Thursday night, you would have thought the “Has Beens” won the Super Bowl. The Canadian Junior Football League’s Saskatoon Hilltops’ annual alumni game came down to the wire, where the team’s current roster clashed with a squad made up of former Hilltops players. The alumni team was also stocked with a few players who graduated from various post-secondary clubs, where the majority of that representation came from the Canadian Interuniversity Sport ranks. On the final play of the game, tailback David Stevens ran a major in from a yard out to give the alumni squad a 16-14 victory over the current Hilltops. Following the score, the alumni team, which went by the moniker the “Has Beens,” stormed off their bench to mob Stevens in celebration and whoop up the victory in the end zone. The old players showed they still have game and gave the Hilltops, who returned most of their CJFL title winning team from a season ago, a stiff test. Stevens, who was a star carrying the rock out of the backfield for the University of Saskatchewan Huskies, was still as fast and elusive as ever. Watching Stevens play, you wouldn’t believe his final season with the Huskies came back in 2006. If he still had eligibility to play, he might still be one of the top three running backs in the CIS. Receiver Kit Hillis, who just wrapped up his CIS career with the Huskies as their all-time leader in receptions last season, also made a number of huge plays. On the series before the alumni team secured the win, Hillis, who is also a former Hilltops pass catcher, dropped a potential winning TD reception on a third down gamble. On the game-winning drive, he hauled in an intermediate route and turned it into a gain of about 50 yards to set up the alumni team in the red zone. The current Hilltops, who went by the moniker the “Will Be’s,” played inspired, as they ensured their whole roster saw action. Unfortunately, they racked up too many penalties. The "Has Beens" celebrate victory at the Hilltops Alumni Game. Most of the flags came from illegal procedure, off-side, illegal substitution, too many men and illegal formation calls, which was surprising to see from a veteran club. They had a number of instances where players weren’t aware if they should be on the field or not. On one play, an official chuckled he didn’t have to throw a too many men flag, because the Hilltops offence ran a play with 11 players. Head coach Tom Sargeant and his staff accumulated a lot of video that can be used to illustrate what mistakes need to be fixed. The Hilltops do have time to iron out the errors. They open the regular season on Aug. 16, when they travel to Calgary to take on the Colts. If you have comments about this blog post, feel free to email them to stankssports@gmail.com.